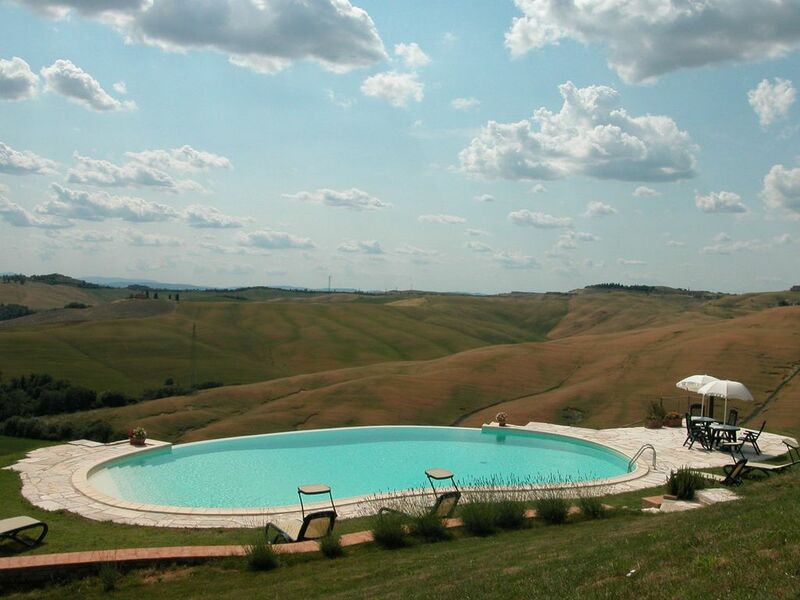 Villa dei Fiori is located not far from Siena (approximately 20km away), at about 4km from the historical town of Asciano, in the amazing countryside of Crete Senesi. The farmhouse has been recently restored and is divided into three nice, large and comfortable apartments. They are ground floor or first floor, each with an independent entrance, wooden beam ceilings and terracotta tile floors. The apartments have been furnished with great care. Each apartment has a private furnished garden and outside parking space. The view from every apartment is unique. From the swimming pool, it's just breathtaking. APARTMENT PAPA (approximately 80 sqm) First floor. Independent entrance via an external staircase.Living-dining room with kitchenette (small oven, 4-ring gas cooker, hood, fridge, American coffee machine), sofa, satellite TV. Two double/twin bedrooms. One single bedroom a second bed can be added on request), two bathrooms with shower. The accommodation also offers the following services included in the price: one small barbeque per apartment, use of bikes, baby cot and high chair to be requested at time of booking.Additional facilities include: reception, use communal laundry room with washing machine/iron/ironing board (payable extra), use of Internet point in the reception (payable extra), special discounts for a health centre approximately 13km away (please enquire at the property), direct sale of typical Tuscan products. Arrival Saturday-Saturday in high season, possibility to arrive on different days in low season. Please ask at time of enquiry. USE OF WASHING MACHINE €5 PER LOAD INCLUDING SOAP, IRON & IRON BOARD USE, LOCAL TOURIST TAX APPLICABLE €0.50 PER PERSON PER DAY (MAX 3 DAYS).